Depending on whether you live in a cave or not, this may or may not come as a shock. It started as a bluff. Everyday I’d wake up and joke about it. I’d comb my hair different just to see what people would say. During the combing, half my hair would fall to the floor of my bedroom. It was just sad. A visit to the salon would make me feel stupid. Nothing would change despite leaving money behind with the hairdresser. The pixie cut lost its form. A colleague asked me if I go to the salon at all because it looked bad. And that was the end of me and that pixie, in my head. Everyone thought I didn’t care about my hair. That was bad. I stopped going to the salon. I would wash am treat my hair myself at home, contemplating my next move. Then one Friday night, in an effort to relive my high school memories, I dug out my auto book (I think that’s what we called them). You know, that book you made everyone you knew sign and write nice things in high school before you left. I kept turning the pages, and it seemed every other girl could not sign off without mentioning how nice my hair was. Keyword: was. Let us all observe a moment of silence. I messed up that nice hair that M high-school mates sang praises of with many years of continuous retouching. That nostalgic moment was a few weeks ago. Enter last weekend but one. Friday night, I tweeted. The men made jokes. I woke up early on Saturday but didn’t get out of bed. I knew I was going to do this one way or another. I turned on data and hit Google. Who cuts your hair in Kenya? After about an hour of visiting blogs which didn’t help, I ended up on a nation article. It had a picture of a girl with a very stylish haircut. And just like that, I fell in love. The picture was taken at Merco’s Salon. I Googled it and landed on their Facebook page. Oh the haircut on that page. I was totally sold out. I sent that link to two of my girls, just to hear their opinions. BFF loved it, she’s a natural hair crusader. My Nigerian girlfriend, another crusader, said it looked like a boy’s haircut. To hell. Imma just do it, I told myself. I got out of bed and told everyone in the house what I was planning. No one believed me except for my sister. I remember she touched the long front part of my deformed pixie and said, “Bye hair!” before she left with dad. I called the number on the Facebook page and made an appointment. The journey to town was a blur. I found myself on the 1st floor of Lyric House because I got out at the wrong time. Lol. I always do that, get off the lift when I’m not there yet. I saw Tony Airo’s salon there. I took the stairs and found Merco’s on the 2nd floor. From talking to some folks in black t-shirts, to waiting on a couch for a while, to talking to the boss who had the craziest hair cut which kinda assured me I was in the right place, I ended up on a chair, talking to one equally assuring guy with dreads and cool bracelets. He asked what I wanted. I began my long story of bad hair and a patch of hairlessness on the side of my head. I showed him the cut I saw on Facebook. He scrutinised the patch and walked away. I freaked out. Thought this would not work out. But he came back and said he’d see what he could do. I liked him instantly. After a wash, the scissors took out the long part. Then the work began. You will not believe this, but that cut took two hours. He would cut a bit and disappear, then come back and say that the breaks were for me to get used to it, or like Evelyn said, to acclimatise. 😀 The funny thing is I didn’t feel like something momentous was happening. It just felt right. Plus he was a perfectionist. Dude cut my hair so we’ll, with utmost care, I felt that the transition was taken as seriously as I wanted it taken. We dyed the remaining hair to make it black and voluminous. You know I have white hair. So we hid it to make the change a bit more palatable to people. And that’s how, three hours later, I ended up like this. I walked out of there feeling super good. I had done what everyone thought I could not do. When Evelyn asked me how I felt, the only thing that came to my head was “I feel like a woman!” Seriously. She loved it when she saw me an hour later. The drama was when I got home. Baby sister got out when I opened the gate. “Ngai! Nienjire!” she shouted as she ran back into the house. God! She cut it! Dad emerged from the other door. “Eh gaka kahii gaitu!” Here’s our little boy! I found mum seated in her sofa. She looked at me and said the same thing she says when I do something different to my hair. “Uguo niguo weka?” Is that what you have done? I laughed at all of them. I needed two more reactions. Big small bro feigned shock and stood frozen for some minutes, hand in mouth. Small bro with asleep. First thing he said when he would was, “Nduhana uru btw,” with a wry smile. You don’t look bad btw. I could document all the reactions I’ve received these two weeks, but I’m tired and need to sleep. All I know is, this is the best decision I have made about my hair in many many years. Yeah, it’s still as tough as steelwool. But I can finally take a real shower! Not showering in funny poses because no water can touch my hair. It drizzled yesterday and I couldn’t have cared less. I just might like this so much, I will never grow it again. There you have it. I never thought this day would come. Lol! Finally I can bring my natural hair stories here. 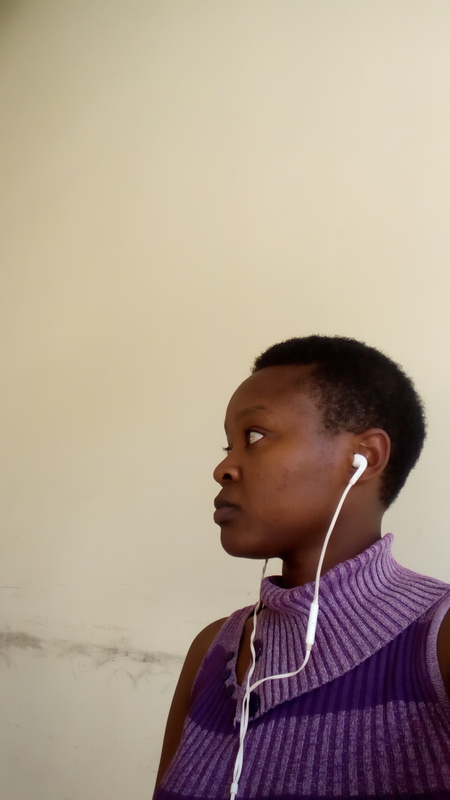 Anyway, I cut my hair (again) in November, mostly coz I was tired of the dye. And you know I realised the other day that right now my hair is like the healthiest it’s ever been. That cut did me a lot of good. I hope yours works out too. Lol. Yes. Finally. The floor is yours. I love it. Especially when it’s all wet and nice to comb. ? I like the new hairdo. Can’t wait for you to start rocking the fro! If you don’t have an actual peeve about your hair, then don’t do it. Mine was a necessary move. Thanks Zeddy! Hehe. I like the elitist comment. Most naturalistas make it look like that. And that’s why I did it for me too.